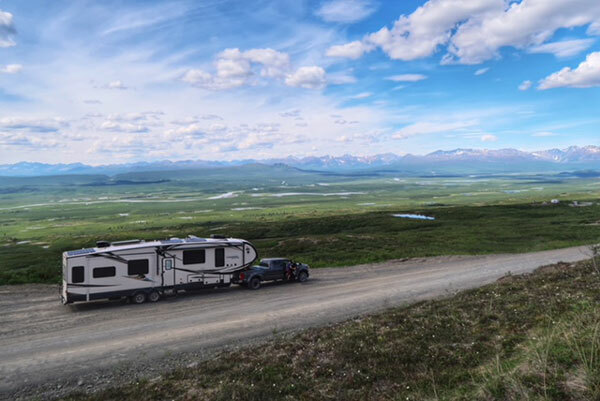 Yesterday I began sharing my 10 tips for RVing to Alaska. We covered bug & mosquito populations, road conditions, and route decisions. Today we will discuss weather conditions, internet access, wildlife encounters, RV/truck breakdowns, flat tires/cracked windshields, food prices, and mail retrieval. We were shocked by the amount of cloudy, overcast days we experienced in Alaska. I can count on one hand the number of times I wore a short sleeve t-shirt while my shorts were only worn 3 times! A quick scroll through the photos in this post will reveal the cloudy days and long sleeves we grew accustomed to. Rain was common, particularly along the coastal towns of Skagway, Seward, Homer, and Valdez (where we stayed from the end of July until the end of August) and the majority of our cloud-free days were in Fairbanks (we were there at the end of June). Photo: Even this beautifully sunny day began with a thick layer of fog that didn’t lift until afternoon. Note our rain jacket attire! Our ability to use solar as our main source of power was limited greatly by the grey days. We used our generator for power and our propane heater way more than we ever expected. In retrospect, our solar additions were an unnecessary modification for this particular trip. RVING ALASKA TIP #4: I would consider rain boots and raincoats to be a staple summer item. On average the weather we experienced was in the low 60’s. When you primarily boondock you don’t need to adhere to a strict travel itinerary. If your schedule is flexible, I’d suggest watching the weather forecast and following the sun. One older couple that we met said this is how they traveled Alaska and I thought it was brilliant. Similar to the lower 48, if we were near a town or city, we had internet. Because we need the internet for work, we opted to have both ATT and Verizon service. Overall Verizon worked well throughout the state but we did find that the town of Homer worked best with our ATT connection. 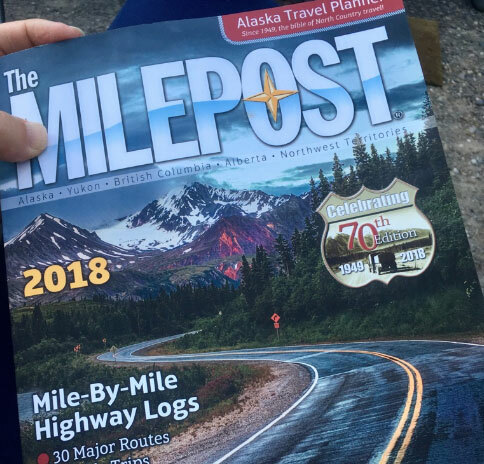 While driving to Alaska we faced larger limitations. Our particular service allows us a daily amount of data before throttling (reducing) our speed. We needed to carefully ration our usage. We also experienced periods of a few days or even up to a week without service at all while moving through the Yukon. RVing in Alaska last summer taught us many things. We gained not only a useful perspective but some much-needed confidence. Alaska is a lot of things but being wholly predictable is not one of them. 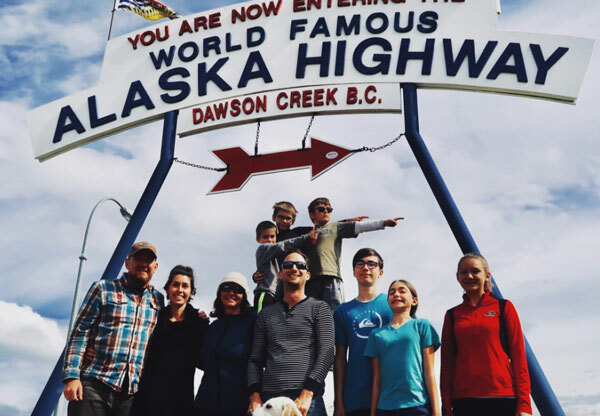 Prior to beginning our trek from Northern Idaho through Canada toward our family’s 50th state, we had a growing list of Alaska fear factors that others had helped us build. I’d like to take that list and work through the fears one by one separating out fact from fiction and offering up my top tips. When I first set out to share my top 10 tips, the content quickly became too detailed for one post. Therefore, I have broken the list into two parts. Today I will cover bug & mosquito populations, road conditions, and route decisions. Next, I will follow up with weather conditions, internet access, wildlife encounters, RV and truck breakdowns, flat tires/cracked windshields, food prices, and mail retrieval. Let’s get started! 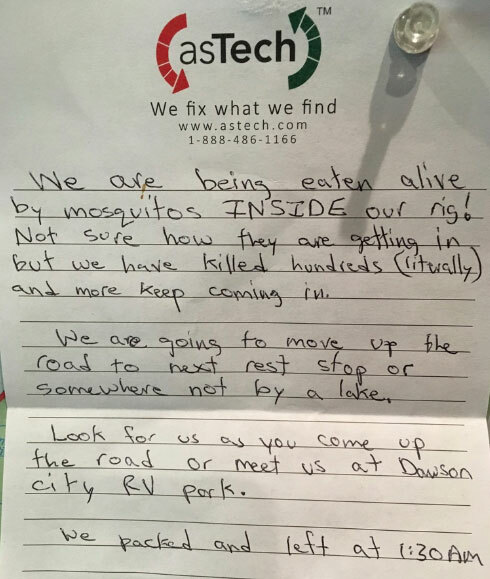 We’d heard horror stories about the HUGE Alaskan mosquito population. Yes, we’ve been to the Florida Everglades. Yes, my husband grew up in the humid, lake filled, mosquito-ridden state of Minnesota. But Alaska was worse, way worse (at least that is the story we kept being fed). Driven by my desire to survive, I purchased garlic capsules. I added “take garlic” to our morning routine hoping it would help make us less tempting to bite. In the end, the area of bugs and mosquitos was perhaps one of our top surprises. While we did find isolated pockets with a healthy mosquito population, on the whole, they were so frequently not present that we would often forget to be thankful for their absence. Given the size of the state, this isn’t necessarily surprising. In the lower 48, Minnesota has a lot of mosquitoes but Northern Idaho does not. Roughly 1,000 miles separate these two states. However, in Alaska, you can travel 2,700 miles and still find yourself in the same state. 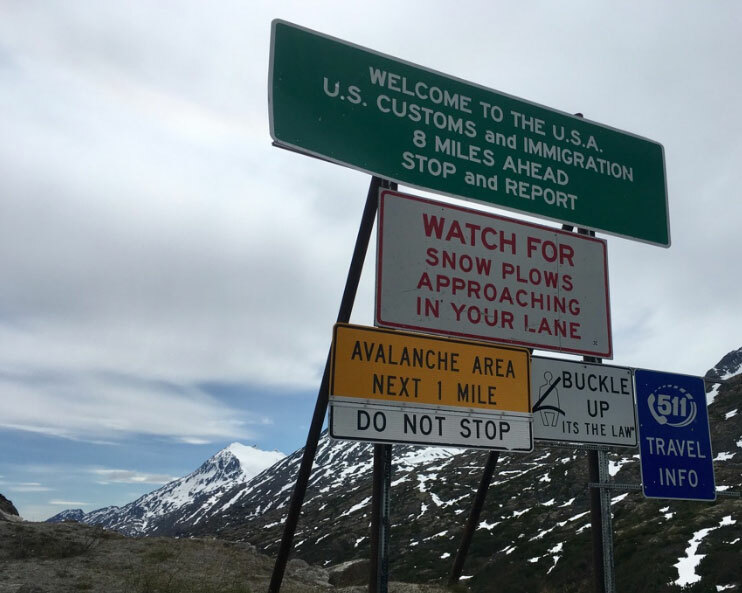 It makes sense then that there will be areas within Alaska that are very bug-heavy (those who opted to drive to the Arctic Circle told us they practically battled bugs in hand-to-hand combat) and many areas that are not. Ironically, our most prominent mosquito memory occurred in the Yukon, NOT in Alaska. RVING ALASKA TIP #1: Our traveling friends own an electronic, hand-held bug zapper. Not only is this useful in eradicating bugs from your area, but the kids find it to be intensely exciting to use. We also found mosquito head nets to be useful while fishing in a few locations where the bugs were thicker and our hands were busy (clicking through will take you to Amazon via my affiliate link). Our worst mosquito encounter occurred when we boondocked next to a placid lake. It’s probably best to be leery of a location that is so ideal for mosquito reproduction. Overall, roads in Alaska fall somewhere between fair and good. Few roads were actually bad. Those that were did not surprise us and were typically not a required route—we simply opted to drive them anyway due to the lure of fantastic views. Photo: The Denali Hwy. This was one road that we regretted traveling on due to the exorbitant amount of dirt it brought into our RV. Again, the drive to Alaska through the Yukon offered the largest stretch of roads that were in repair. I also think it’s fair to say that our scale of what makes a good road “good” was diluted slightly as our time in Alaska lengthened. Photo: After driving the Denali Hwy. 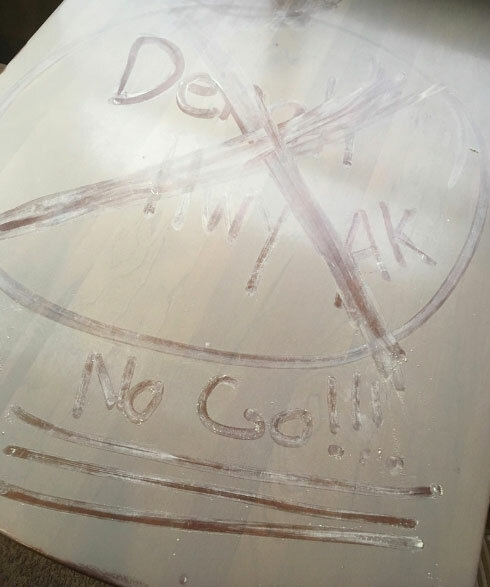 we spent several hours cleaning the entire RV from this thick layer of dust. By the end of the summer, we certainly hadn’t driven freeway speeds in many months. However, who would want to miss all the beauty? Going slower sure aids in taking in the breathtaking vistas and animal sightings! 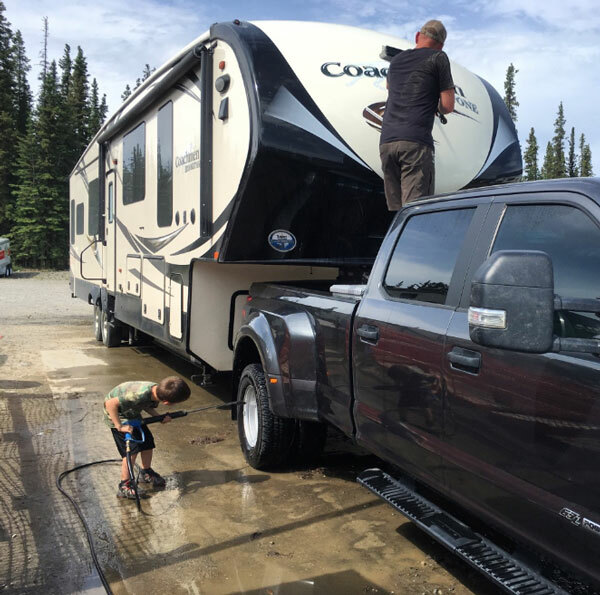 Photo: After taking the Top of the World Hwy, the truck and RV get a MUCH needed wash! Some people say it’s best to face your fears. However, in order to embrace the freedom that is waiting on the other side, we need more than posture, we need a plan. Here is what I have found to be the number-one most effective strategy: pray out fear. We don’t often realize how many decisions are based on our fears. While some fears are rational and designed to keep us alive, I believe most of the fear that guides our decisions are not of this life-preserving variety. These fears need to be identified and dealt with. It’s become a little game I play—an adult version of hide-and-seek—identify areas in my life where fear is hiding. Because of our traveling lifestyle, my circumstances are continually shifting. This means I always have a lot of new material to work with, making it easier for me to flush out fear from its dark corners so I can meet it head-on and pray it out. Since we started traveling, I’ve found that each region of the country has its own natural disasters, potentially deadly animals or unique hazards. Residents worldwide are often pretty low-key about the particular brand of danger living in their own backyard. However, there always seem to be a group of people who haven’t actually been to said location but yet have strong opinions which they must share for the sake of our family’s health and welfare. We discovered this to be particularly true while planning our trip to Alaska. As often happens, the list of fear factors only seemed to grow with each new person we spoke with. 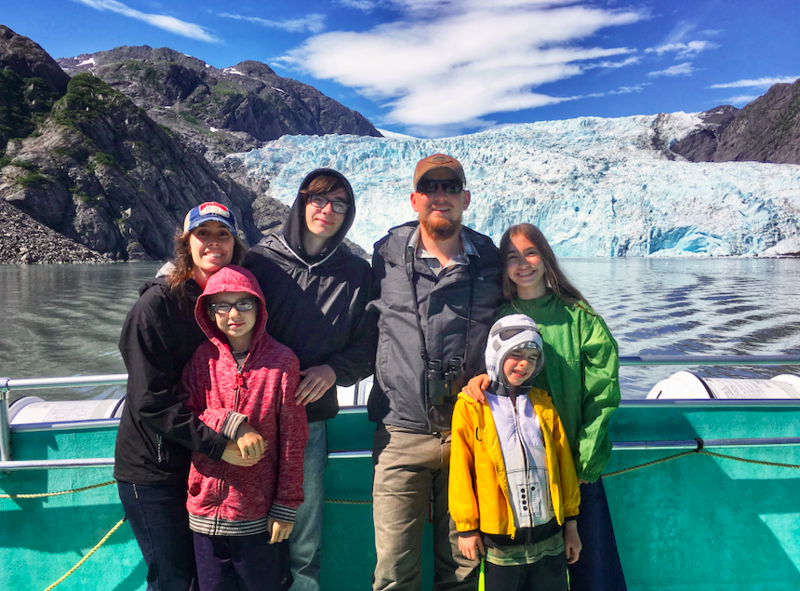 As our Alaska departure date drew near, I noticed how frequently this group of people rotated around this list like vultures, picking at their own favorite fears and flinging them in our direction. I will admit, the temptation to bite was strong. Back in January, we attended a Fulltime Families Retreat in Southern California. One evening, we invited the Sloan family over to get to know them better. Part of our conversation included upcoming summer destinations. They planned to visit the East Coast and our plans included Alaska. 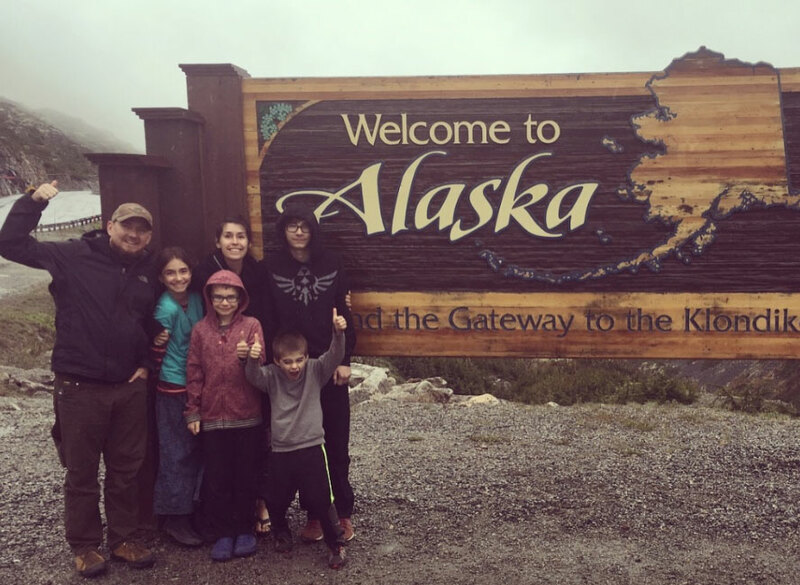 The next morning the Sloan’s informed us that their summer plans had changed during the night—they now planned to go to Alaska with us! Surprisingly, this isn’t that unusual in our lifestyle. You meet people. You like them. You travel with them. But it is funny to take myself out of the fulltime travel mindset and try to picture a scenario like this happening. You invite someone new to the area over for lunch after church. You talk about your upcoming plans for a family vacation to Florida. The following Sunday they announce surprise: they’ve booked the same flight and plan to tag along! I can’t imagine that ever happening, yet it does when you live your life on the road and get the freedom to choose your neighbors and travel companions. 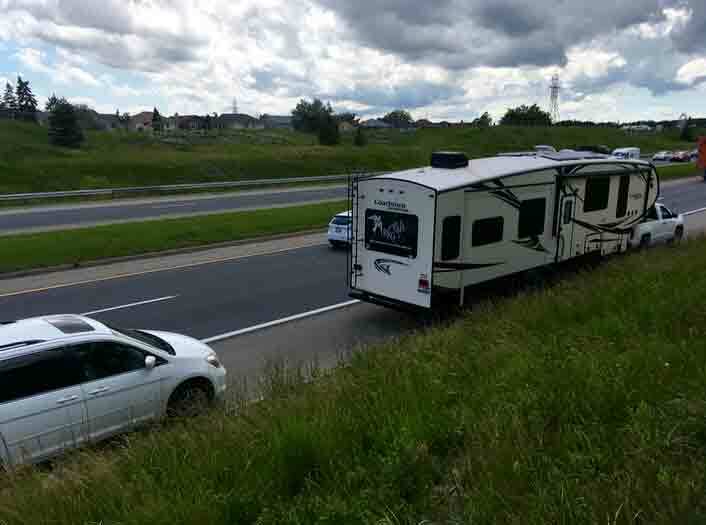 Just West of Lake Ontario, our hazard lights blink-blink-blink as the freeway traffic rushes past us, sending the vehicles into small sideways rocking motions. The truck, whose engine has been whispering notions of discontent for the past few hundred miles, has acted like a toddler and erupted into a full-blown tantrum. We are perched like birds on the shoulder of the road.